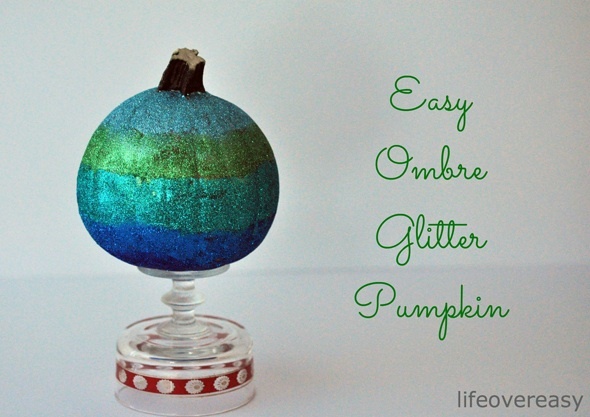 Get ready to create an easy ombre glitter pumpkin that’s right on trend for this Halloween season. I’ve always enjoyed doing crafts for as long as I can remember. To be perfectly honest, the only time I’ve gotten around to it for the past several years is during the Christmas season. I think as my son got older and lost interest in doing those sorts of things (and glue guns and paint brushes were never my husband’s thing), how I spent my free time over the years gradually changed. However, since my son left for college in September and my husband has been traveling a fair bit for work, I’ve started getting back into it. Perhaps it’s something I’ve picked up again to keep my mind busy (so I don’t go crazy) or maybe it’s a phase I’m re-entering. Whatever this new energy and interest is, I’ll take it! Speaking of crafting, I asked my Canadian blogger friend Dani from Life Over Easy (whose eldest daughter just left home as well- sniff, sniff) to stop by and share one of her amazing DIY projects. I’m always impressed by the creativity of some people, and knew Dani would be the perfect person to come up with something fun for the Thanksgiving and Halloween season. Get ready to pin! Hi everyone! My name is Dani and I’m visiting from Lifeovereasy, where I blog with my sister Nads about all things food, fun, design, and anything else involved in creating a happy home. I’m so excited to be here at Satori Design for Living! I’ve been a fan of this blog for some time now, and getting to know Shauna through her posts and pictures has been so inspiring. Shauna knows how to add a beautiful touch to any interior, and I’m sure you’ve all learned a lot of tips and tricks to help make your home look and feel its best. 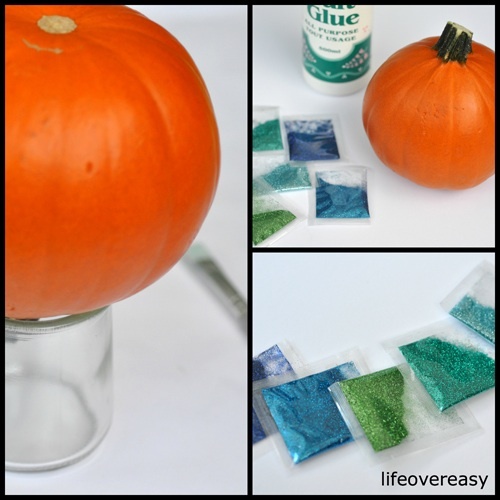 Today I’ll be sharing a little project for creating your own beautiful decorated pumpkin using glue and glitter. What could be more fun than glitter? Just ask any 5-year-old girl you know, and she’ll tell you that EVERYTHING looks better with glitter – even pumpkins! This craft is quick and easy, and costs less than $3 – you can’t beat that! I found the glitter at the dollar store, the pumpkin at the grocery store, and had the craft glue at home. Easy as pumpkin pie! I propped my pumpkin up on a glass, and started working with the darkest colour on the bottom. I decided to use 5 different colours of blue and green glitter, moving from darkest to lightest to get a nice ombre look. All you need to do is apply a layer of glue with a brush, sprinkle on some glitter, shake it off, and then repeat with the next colour. I applied 3 colours of glitter in bands around the pumpkin, just roughly estimating the size of that band so I would have room for all 5 colours. You don’t need to be precise – it all looks great in the end! After applying the first 3 colours, I let the pumpkin dry overnight and then flipped it over to apply the last 2 colours, ending off with the lightest. And voilà, a pretty pumpkin! This little pumpkin can add a sparkly touch to any of your fall vignettes. I chose a blue palette just for fun, but you can choose a more neutral colour scheme, or perhaps some gorgeous fall browns, oranges, and yellows. The sky’s the limit! And with this craft costing only a few dollars, you could make yourself a bunch of these pretty pumpkins to brighten up your home this fall. For more decorating ideas, drop by and visit Lifeovereasy and check out what we’re up to. This glittery guy needs a few friends, so I think there just might be a few more fun pumpkin ideas coming up! Thank you, Dani! 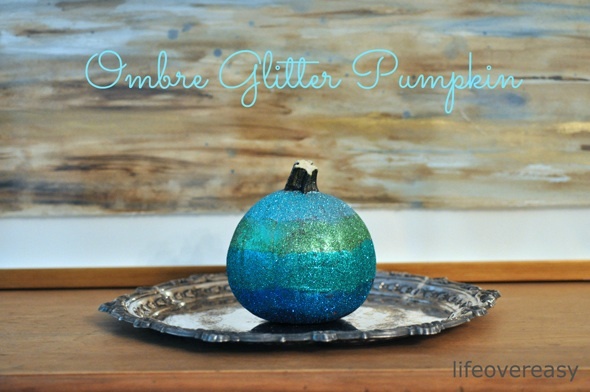 Your ombre glitter pumpkin is so on trend right now and I may have to give it a whirl this weekend. To all of my Canadian friends, I hope you enjoy your Thanksgiving weekend. I know I have a lot to be grateful for (especially the whole family being home together)! 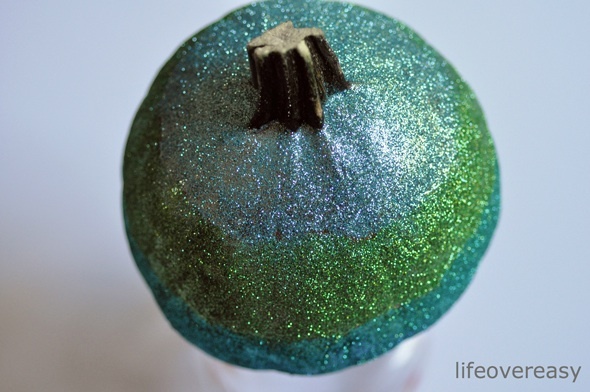 Glitter and pumpkins…2 great things combined! Yes, Dani did an amazing job on this! Thanks Shauna for having me over! It’s always fun to visit your site – so many inspirational ideas! 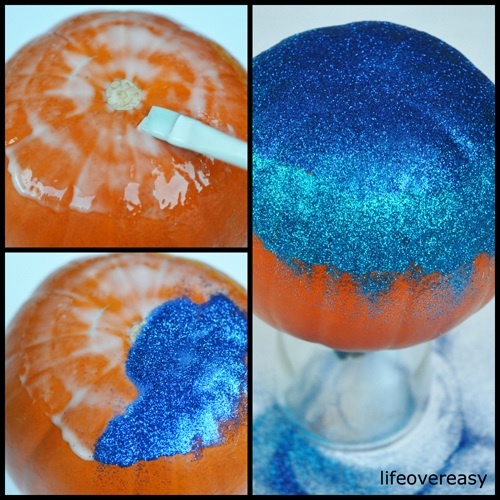 After send our kids off to school, we should have lots of free time for making glitter pumpkins, sniff. What a beautiful pumpkin! I love the colors you have used…it kind of reminds me of the colors of peacock feathers. :) Found you through the Pumpkin Parade. Ombre and glitter! What a great idea! Thanks for linking up to the Pumpkin Parade! I love this pumpkin! Anything glittery is my friend over the holidays! And the fact that it’s ombre – love even more! Great work, Dani! I LOVE this pumpkin! I am so tempted to do this with oranges and reds. That would be gorgeous in those colors!